We are in December 1983. 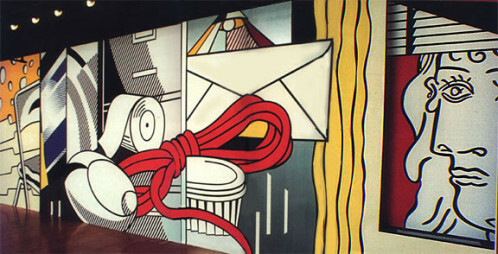 On occasion of an exhibition by Roy Lichtenstein, there is a mural being completed by the artist and his atelier at Castelli’s Green Street gallery. After months of works and plans, they finish it within eight days. 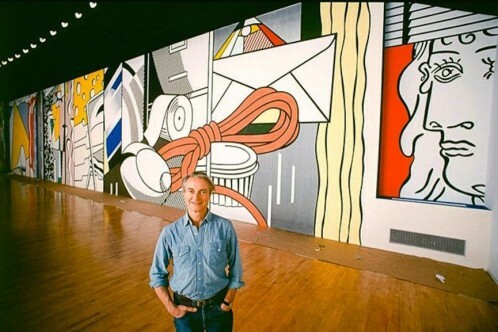 The wall is 18 feet high and 96 feet long and features Lichtenstein’s emblematic iconography such as black and white book covers, pop images of Swiss cheese and bush strokes. At the end of the six weeks show, the wall got dismantled. 30 years later, Gagosian is reformulating this really same fresco in its space on 24th Street in New York. The Green Street mural has been repainted to its closest with the help of Lichtenstein’s former studio assistant and the numerous sketches of the Roy Lichtenstein Foundation. As a socio-historico performance, the mural will be experienced in its same form as in 1983 but by a brand new audience, a new generation of viewers. Along with the wall, related materials, source, drawings and studies explain and represent the exhibition at the Castelli Gallery in 1983. As for the first one, the Greene Street Mural will once again be on show for some weeks before being destroyed and letting only the experience to its viewers.